This card was recently posted during a blog tour (see previous post) however, this post contains the instructions on how to make the card in more details as it is part of my April Class Kit featuring the Parisian Breeze Designer Series Paper and items from the Pretties Kit. It also features Chocolate Chip Wide Satin Ribbon. As part of the Kit, all the paper is already pre-cut and pre-scored for you! All you have to do is stamp and assemble. Ribbon and clear rhinestone brads are all included in the Kit. The Tearing tool is not. 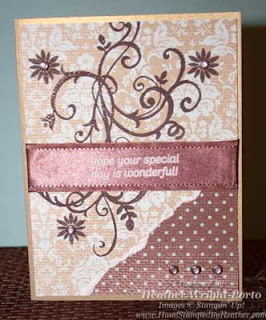 On the polka dotted designer series paper, punch three holes in the lower right area and then place the 3 clear rhinestone brads. Adhere this paper to the bottom of the card front. Stamp images with Chocolate Chip Craft Ink on the other piece of paper using the large swirl and small flower of the Baroque Motifs set. Tear a corner off the right, lower corner of the other piece of designer series paper (see image above). Then wrap a piece of ribbon around the middle of that piece and adhere in the back. Punch a few more holes where you will place 3 more clear rhinestone brads. Then adhere this panel to the card front. A piece of Very Vanilla piece of paper is included with the kit and is adhered to the inside so you can easily write or stamp a greeting.